Finished reading "The Book Thief" by Markus Zusak. This is a heart-wrenching and gut-wrenching novel set in a small German town during World War 2. As expected, there is plenty brutality in the story, but there is much beauty, compassion and human solidarity too. For me, the most unusual feature is the narrator whom I didn't expect but whom I will definitely meet personally sooner or later --- Death. Death, who I am reminded is just as all-knowing and all-powerful as the Creator, tells the story compellingly from start to finish. The reader learns that not every German citizen had shared Adolf Hitler's maniacal bigotry against Jews and other non-Aryans. The reader learns about the limitless compassion of Hans and Rosa Hubermann who became foster parents to a stranger, a 9-year-old girl, and who risked their lives to shelter another stranger, a Jew, in their home. 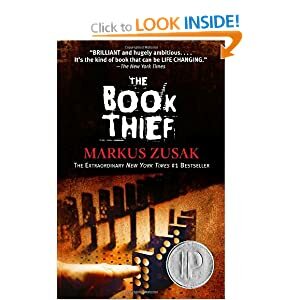 The central figure in the story, of course, is the girl, Liesel, who acquired the dubious character of the book thief. I cannot imagine a reader who would not love her.